Bag Closing Machine with Wooden Slat Conveyor is recognized for easy user interface that allows comfortable handling of involved operations. Suitable for closing the mouth of filled bags, these are highly preferred in industry sectors like Rice/flour, Fertilizers, Sugar, Powder milk, Cattle/poultry feed and others. Further, with all moving parts present inside the main housing, the completely sealed interface also protects the machines from dirt and dust. 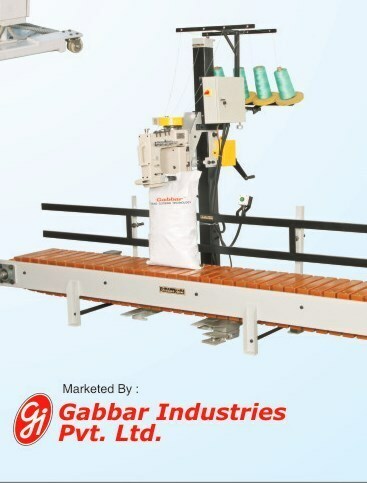 Some of the operational feature of the machines includes capability to handle stitch width from 5mm to 9mm as well as provision of variable speed pulley that provides easy synchronization with existing conveyor. Other than these, the machine also comes with simple inspection and maintenance mechanism. These machines can handle stitching of different varieties of filled bags including those made of materials like Jute, Poly-jute, H.D.P.E., PP and craft paper bags through use of synthetic or cotton thread options.